I kind of like the way the gems of the Reploids glow now, so I wanted to try that with X and Alia. It gives them this Christmas Tree look, but it's cool. I used bright colors because I wanted to accentuate the characters, next time I may try a more faded illumination The logo was made in Corel Draw. X's new helmet reminds me of Tron. BTW, 50000 gallery hits since I revamped it. Cool. =D Yay, You colored it. Great coloring as usual IRA =O I love the glow, and yeah the Helmet of X reminds me of the Tron movie Good work. Very nice work IRA. Just like usually, keep up the dang good work! Alia looks pretty pissed off. 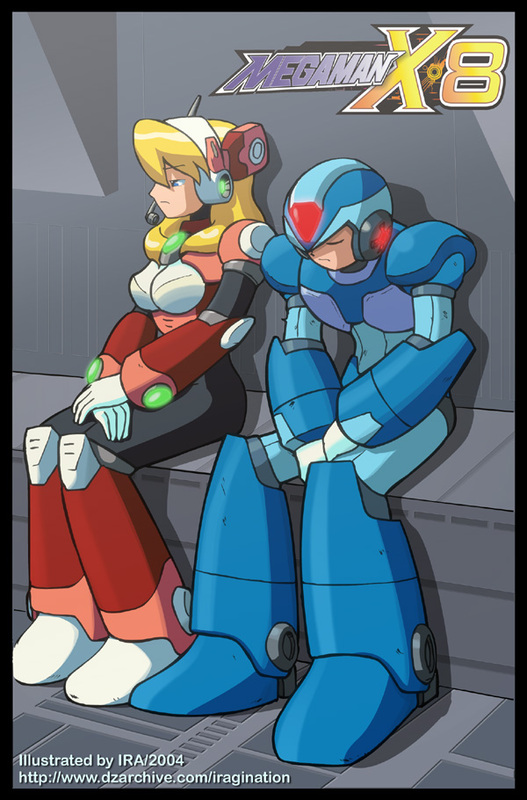 I'm guessing X isn't all that good in the sack from the disapointed look on her face. It's always imrpessive to read the different perceptions that everybody get of a pic. Althougth I didn't mean Alia being mad at X or something, seems like that's everybody consensus... Heh, sure I like this pic. Nice Pic!Good Coloring too.Looks like a screencap or something.Impressive Work! x looks like he lot a battle of rivalry, almsot like he's been trying to beat someone for a long time and once again failed? i dunno but thats jsut how his expression looks. Great job Ira! Somebody is going get angry but they look like a married couple with X being the husband who just returned from a bar fight.